Scarecrow's role in the original Arkham Asylum game was terrific. Not his stages, particularly (those were just standard "avoid the security camera" stealth levels), but his story beats. We see him get into Batman's head in horrifying ways, including one of the most unsettling scenes that's ever been in any Batman story. He even screws with the player! He was great. And while he was (mostly) absent from Arkham City, he's back as the main villain in Arkham Knight. Psychologist Dr. Jonathan Crane's obsession with fear led to him terrorising patients. A master chemist, Crane would combine acts of psychological terror with exposure to a powerful hallucinogenic compound he called his Fear Toxin. Nearly mauled to death by Killer Croc in the sewers beneath Arkham Asylum, Dr. Jonathan Crane has returned to Gotham, surgically reconstructing his scarred visage into a new, terrifying face. If there's one thing that Arkham Asylum, Arkham City and Arkham Origins all had in common, it's that the character presented as the main villain was exactly what they seemed, with no hidden agenda. 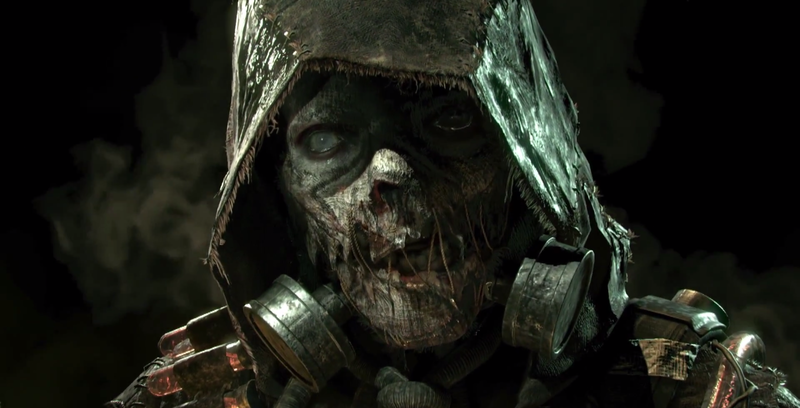 So here's Scarecrow, making his return to Gotham after two years away, with a new face, a new attitude, and a new voice actor, so surely there's nothing suspicious about that! Speaking of a new face, we still haven't seen Scarecrow's. You can catch glimpses of it beneath his mask, though - at least, we assume that's a mask. Is it? 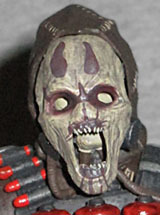 There are no visible lips behind it, and no edges around the eyes, and if you pull back his hood, you can see his ears. It's entirely possible that this is what's left of his face now. He's a psychopath; why would he care about ever not looking like a Scarecrow? In the first game, all the villains were freshly out of their cells, so their costumes had to be cobbled together from the remnants of their prison uniforms - that's why Bane, Croc, and Victor Zsasz were all wearing bright orange pants. But Scarecrow had somehow found a way to dye his brown. Ew. Anyway, now he's wearing real clothes: boots, dark pants, and a long brown coat with a hood. Befitting his crime theme, his pants are raggedy and ill-fitting, and his coat is covered with rough stitches. There are two air filters sticking out of his jaw, and a noose dangling around his neck. There are tubs running all over his body, and he's wearing a harness over his chest that has three large red canisters strapped to the front, four smaller red vials on the shouder, and a pair of yellow-green tubes on his back. Gone are the Freddy Krueger finger-syringes, but they've been replaced with a Wolverine-style set of claws mounted on his wrist. That really still does look more "stupid" than "scary." Plus, they're orange, rather than the red or yellow of the other containers. Do they not all have the same thing in them? Does he have different formulations of his fear gas? I guess we'll find out when the game releases. His articulation is as good as can be expected. Showing the effects of his run-in with Killer Croc, he's got a metal brace on his left leg, but it's designed not to block anything too badly. 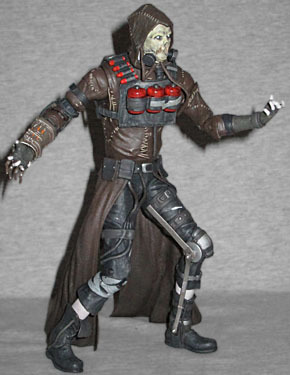 Scarecrow has swivel/hinge ankles, a swivel right shin, hinged knees, a swivel left thigh, balljointed hips, a balljointed waist, swivel wrists, hinged elbows, swivels in the upper arms (though in different spots), swivel/hinge shoulders, and a balljointed head. There's another brace around his right elbow, but it's made from very soft material so it doesn't impede the joint. The waist can get hung up on the belt, so be careful with that. What's bad about the figure, sadly, is the overall sculpt. The (rather stylish) box credits Gentle Giant, but we honestly expect better of them than this. Presumably it's a retouched version of the actual game data - you don't go to the masters of computer sculpting because you want them to not use computers - but there's a general softness. It's crying out for more detail! There actually is a texture to the clothes, but it's so shallowly done as to be non-existent; you've got to shine a high-powered light directly across it to even make it out. As an example: if you look at HD screenshots of Scarecrow, you'll see that his "mask" actually looks more like dirty surgical bandages, which makes tremendous sense for somebody who's just had their face reconstructed; this toy's face, however, is perfectly smooth. All his skin is. The only transition between his fingers and his gloves is paint. Really, whoever at Gentle Giant was in charge of turning this design into a toy should have done a better job. Exaggerate, guys! You've got to push those details, so they read right at this size, or you're left with a 7" figure that looks like an up-sized 4"er. Scarecrow comes with an accessory - a mask, apparently distended in a horrified scream. The sculpt on it is better than the sculpt on the figure's actual face, because at least here there are hints of texture. 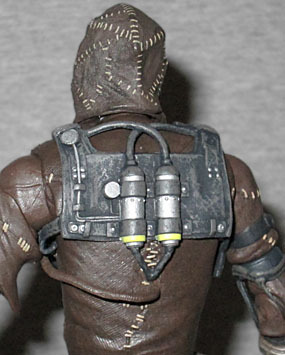 There's a brown loop around the back, and an indentation for a nose, but it doesn't fit on Scarecrow's face because of the air filters. What is it for? What does it represent? Ask us again after June 23. 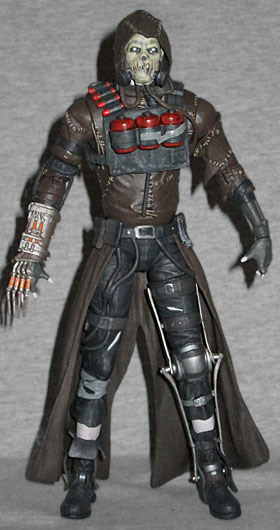 The mask is the same colorless tone as Scarecrow's exposed skin, but has a couple red blotches painted on it. Arkham Knight Scarecrow has a better design than Arkham Asylum Scarecrow, but Jonathan Matthews delivered a better sculpt of the old look than Gentle Giant did of the new one. We're not saying you shouldn't buy this toy, just don't expect to be blown away by it.